Paul Holleran believes Leamington’s impressive start to the National League North campaign could have been even better but for the fixture planners. Successive home wins against Boston United and Bradford Park Avenue lifted Brakes to second ahead of the trip to Hereford on Tuesday night. Jack Edwards’ first-half header looked like extending that sequence but the Bulls fought back in the second half, equalising from the spot before a deflected 85th-minute strike from Jamie Bird handed them all three points. 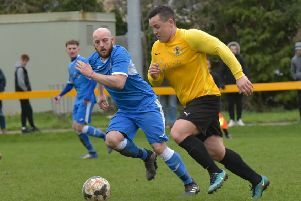 Ahmed Obeng, James Bowen and Matty Stenson were all forced off with niggles and Holleran believes their withdrawals and the subsequent defeat was a direct result of the early season fixture pile-up. “It was the consequences of four games in 11 days,” he said. “Joe Clarke’s Achilles was a bit sore and there was Joe Magunda, we thought we could get an hour out of those two. “Ahmed had started well and Matty Stenson’s calf was tightening up and we didn’t want to take the risk. “James Bowen, they were all players with little niggles who had missed chunks of pre-season and their bodies can’t take four games in 11 days. “We had a couple of players on who could have done to be off the pitch and we looked a little leggy. Nevertheless, Holleran still felt his side had done enough in an impressive first half display to win the game. “We’ve hit the inside of the post, missed a one-on-one and got into some good positions. “It was a really good game and I don’t think any side deserved to lose it. Holleran will now look to patch up his side ahead of a home clash with Guiseley tomorrow. The visitors, relegated from the National League, have yet to win a game this season but the Brakes boss still expects them to be challenging for honours come the end of the campaign. “It will be a really tough test.